Making easy ornaments is a great activity for family and friends of all craft skill levels around Christmas. 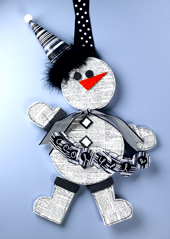 This cute snowman ornament is made with STYROFOAM™ Brand Foam, decorative paper, paint and ribbon. Discs, one each: 8" x 1"; 6" x 1"
Sheet, 36" x 12" x 1/2"
Black marabou trim, 1/4 yd. Black plastic-coated wire, 1 yd. Wax serrated knife with candle stub or paraffin. Cut mitten and boot patterns from foam sheet as indicated. Cut remaining patterns as indicated. In addition, cut four 1" x 3" cuffs from black card stock; trim one long edge and both short edges of each piece with scallop-edge scissors. Trace boots, mittens and both foam discs onto back of news paper; be sure to reverse one boot and one mitten for left and right. Cut out pattern pieces and use paper glue to adhere to foam; let dry. Use foam brush to apply thin, even coat of découpage medium to front of all paper-covered foam pieces. Sprinkle wet medium with glitter; let dry. Paint nose orange; let dry. Use marker to draw dashed line around edges of nose and each white button. Glue white buttons to black buttons. Glue cuffs to mittens and boots. Glue two toothpicks halfway into center bottom edge of each mitten and center top edge of each boot. Glue ends into edges of large foam disc as shown. Repeat for 6" foam disc. Spread small amount of foam glue between foam pieces to secure. Punch eight 2" circles from striped paper and eight 1" circles from black cardstock. Glue small circles to larger ones and adhere letter stickers to spell "Cool Yule." Punch tiny hole in top of each striped circle. Thread letter circles, one at a time, onto wire and twist several times to secure. Be sure all letters are visible at front of garland. Use awl to poke hole through center of each mitten; insert wire ends into holes and coil several times at back to secure. Glue eyes, nose and buttons to snowman. Use marker to draw border around head, body, boots and mittens. Overlap and glue angled sides of hat piece to create cone. Use paper glue to glue marabou trim around base of hat; trim excess. Use glue gun to glue hat to head and foam ball to tip of hat. Tie striped ribbon around neck and knot at front; trim ends in a "V." For hanger, carefully insert polka dot ribbon through striped ribbon at back of snowman and knot ends.